The rated full load speed is always listed on a standard 3-phase induction motor in RPM. 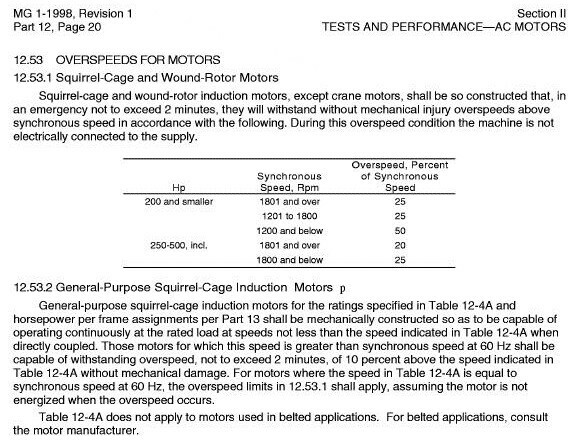 The question is where does one find the maximum rpm possible for a motor? Is it from the manufacturer only? There is no ref. in NEMA mg1 on this particular subject that I remember. Is it more a function of insulation rating or mechanical transmission I.E. bearing life? Yes, sorry....If someone wanted to run the max of a 4 pole motor at 3000 rpm. What is your application? How big & fancy is the motor? This question came up in one of our drive applications. I couldn't get a firm maximum RPM value from our rep. He said you can overspeed them somewhat, but you lose HP. I would call the motor manufacturer to get an answer. If you are going to regularly operate in the 3000 RPM range, you should probably get a 3600 RPM motor and control that instead. It's not a question dealing with a specific application. Is it something a motor mfg. can only answer (like you said calling the company)? I was looking for documentation or information that elaborated on the concept of over-driving standard 3 phase motors. With reference to nameplate data and NEC 430. I really appreciate your help Redsy. A friend of mine found the information I was looking for. It was in NEMA MG-1. There is no reference in NEC for this motor information. The image is a screen capture of the appropriate page. 12.53.1 is the applicable clause. It's a pain sometimes weeding through the information. Is the table shown actually 12-4A, or is that shown elsewhere?